Destination Knowlton >: Quaint Village or Monster Truck Show? Tourists often find themselves standing in what should be the picturesque center of the village of Knowlton on the corner of Lakeside and Knowlton Road only to find themselves surrounded by overheated, diesel belching trucks and semi's hauling loads right through the village. The trucks are both noisey and smelly...not really a quaint village atmosphere! Many towns and prgressive municipalities have bypasses for such traffic but Knowlton seems to have no plan in plae and allows massive heavy machinery free reign of the roads. Maybe great for "progress" but not for tourists who are starting to compare Knowlton Road to the Tachereau Boulevard, a large Montreal roadway known for long traffic jams and aggressive drivers. 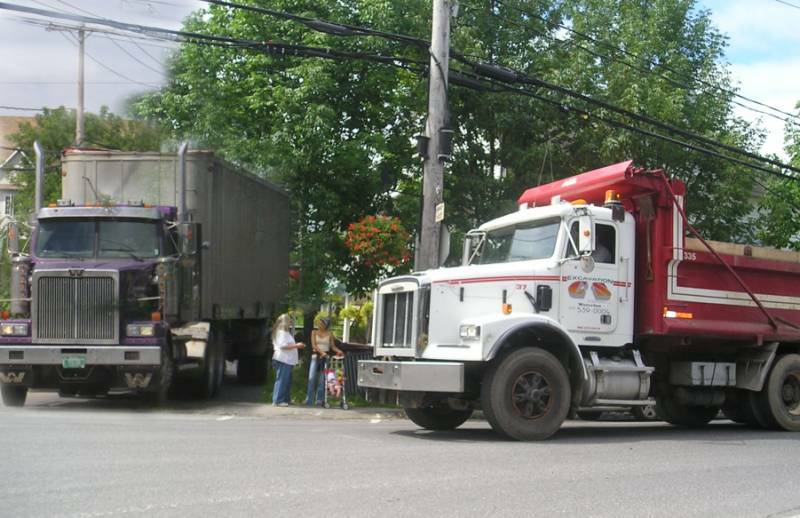 A letter to the editor from a recent visitor to Knowlton expressed what many residents and tourists to Lac Brome have been concerned about for a long time: truck traffic in the center of the village. 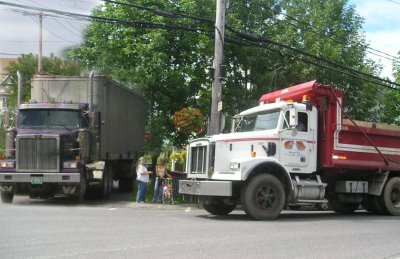 There is a constant flow of dump trucks and heavy duty trailer hauling rigs chugging up the hill over the Mill Pond Bridge and grinding their engine brakes into the village four way stop at an alarming rate. In Nancy Eaton's letter which appeared in the Brome County News she stetes "the charm of the village is completely destroyed by the constant flow of noisey, heavy trucks passing through the very heart of it. This is madness..." she says, " The village is in desparate need of a bypass for this kind of traffic. Please!". Of course we must accept the growth of Knowlton will bring about more and more construction which means more heavu machines and trucks as residents build ponds and houses in the area but the diesel spewing trucks are dirty, noisey and dangerous as the large vehicles take over the narrow central road through town. The four-way-stop in central Knowlton is often a scene of backed up traffic and huge trucks idling and crawling at a snails pace forcing the tourists to plug their ears and watch thewy don't step off the sidewalk into the traffic. Try sitting and enjoying a meal on one of the outddor terrasses and you'll be assaulted by noisey trucks all day long. The sidewalks are already barely wide enough for two people to walk side-by-side! Parking in the village is tough to find and we see people walking by the library getting showered with black diesel fumes! Ughhhh! It's hard to say if the Knowlton elected officials will be able to address this issue or if they will just let tourists decide not to return because of the lack of peace in the village?